Scientist at the University of Washington has performed the world's first ever non-invasive human-to-human brain interface, in which one researcher was able to send a brain signal via the internet to control the hand motions of a fellow researcher. This comes after researchers at Duke University in the US demonstrated brain-to-brain communication between two rats and Harvard scientists have demonstrated it between a human and a rat. The university announced that researcher Rajesh Rao used Electroencephalography or EEG — routinely used to record brain activity non-invasively from the scalp — to play a computer game with his mind. Across campus, researcher Andrea Stocco wore a magnetic stimulation coil. 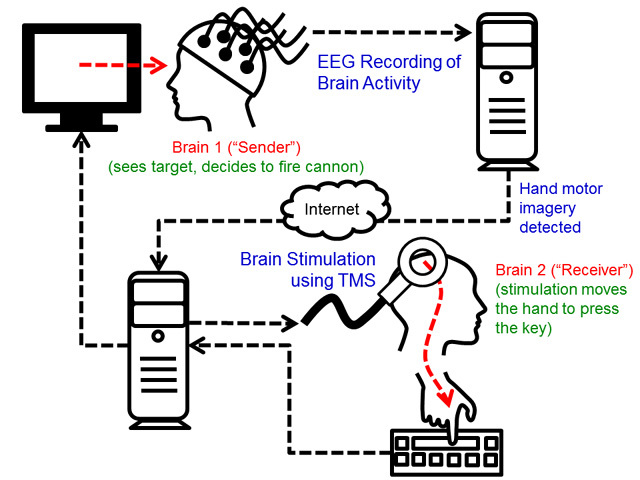 Stocco's right index finger moved involuntarily to hit the "fire" button as part of the first human brain-to-brain interface demonstration — the thought that was transmitted by Rao. Rao, a professor of computer science and engineering who has been working on brain-computer interfacing for more than a decade, said, "It was both exciting and eerie to watch an imagined action from my brain get translated into actual action by another brain. This was basically a one-way flow of information from my brain to his. The next step is having a more equitable two-way conversation directly between the two brains." "The internet was a way to connect computers, and now it can be a way to connect brains," Stocco said. "We want to take the knowledge of a brain and transmit it directly from brain-to-brain," Stocco added. On August 12, Rao sat in his lab wearing a cap with electrodes hooked up to an EEG machine, to read electrical activity in the brain. Stocco wore a purple swim cap marked with the stimulation site for the transcranial magnetic stimulation coil that was placed directly over his left motor cortex — which controls hand movement. The team had a Skype connection set up, so the two labs could coordinate though neither Rao nor Stocco could see the Skype screens. Rao looked at a computer screen and a simple video game with his mind. When he was supposed to fire a cannon at a target, he imagined moving his right hand (being careful not to actually move his hand), causing a cursor to hit the "fire" button. Almost instantaneously, Stocco who wore noise-cancelling ear buds and wasn't looking at a computer screen involuntarily moved his right index finger to push the spacebar on the keyboard in front of him, as if firing the cannon. Stocco said the feeling of his hand moving involuntarily was that of a nervous tic. 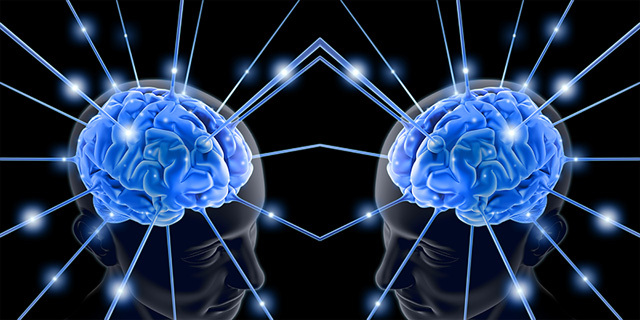 Transcranial magnetic stimulation is a non-invasive way of delivering stimulation to the brain to elicit a response. Its effect depends on where the coil is placed; in this case, it was placed directly over the brain region that controls a person's right hand. By activating these neurons, the stimulation convinced the brain that it needed to move the right hand, the university said. Rao cautions that this technology at present only reads certain kinds of simple brain signals, not a person's thoughts. And it doesn't give anyone the ability to control your actions against your will. Will Breast Milk Be a New Superfood of The Future? Are We Ready to Connect Our Brains Directly to The Cloud? Nexpected provides glimpses of next expected advancements in the field of science and technology. Our mission is to share the knowledge with our readers. Nexpected.com is a combined effort where readers can also contribute articles, ideas, and videos.